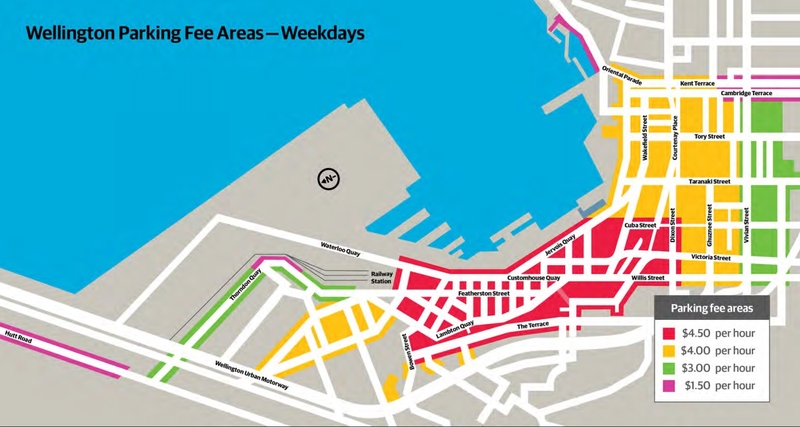 Wellington Council and a few private operators manage the parking around Wellington. We’ve put together a quick guide of parking options available, concentrating around the downtown area. Hourly parking fees in the central business range from 1.50 to $4.50 per hour during the week. The fees apply from 8.00am to 6.00pm and until 8.00pm on Fridays while at Thorndon Quay, fees last until 9.00pm. Weekend parking is lowered to $1.50 and $2.50. Parking is also free on Public Holidays. The pay and display machines take cash, credit card and text messages. Refer to the parking map photos at the end for parking locations. 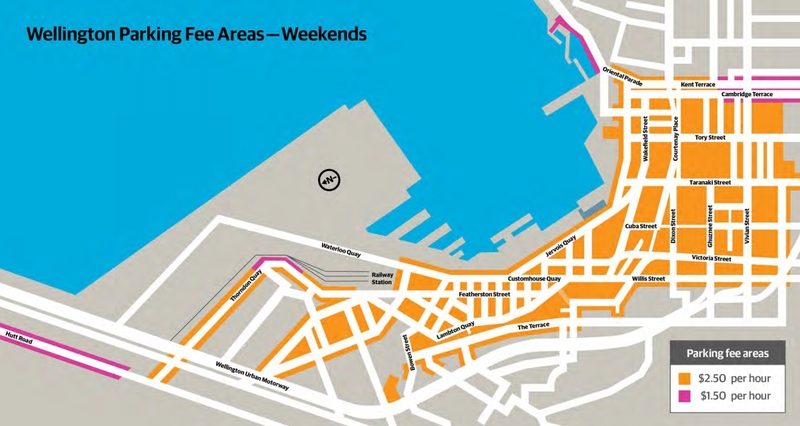 Wellington Council manages the Civic Square, Michael Fowler Centre and Clifton Terrace car parks all located in the CBD. They cost $4.50 an hour from 6.00am to midnight and $2 an hour from midnight to 6.00am. Prices and payment methods vary, so check the signs when you park. Refer to the Wellington Council parking website for more details. If you leave your car overnight, the total charge is made up of any of the above fees that apply during the total time upto a maximum of $18 per weekday or $6 per weekend/holiday parked. Wilson’s is New Zealand’s largest private car park operator and manages over 30 car parks in the CDB area. View their car park location map to identify your best option. Mobility parking permits allow you to park in a council owned car park (excluding parking buildings) for longer than the time restriction. The same parking fare applies. A full list of ‘mobility car parks’ can be found on Wellington City Council’s mobility parking page. SmartPark is a personal parking meter that you keep in your car to take away the need to have cash for meters or pay and display machines. You need to lease a SmartPark meter and buy a pre-paid SmartPark card from the Council's service centre in Wakefield Street or from Wellington Parking and Infringement Services on 40 Taranaki Street. There are $50, $100 and $200 value cards available with a $5 cost for each card (a $50 value card will cost $55). An hour’s parking in the terminal is $12 (uncovered parking) or $15 (covered parking). Long-term parking cost is $34 for 24 hours (uncovered parking) and $42 (covered parking). Check the Wellington Airport Parking website for full pricing information and to book online.